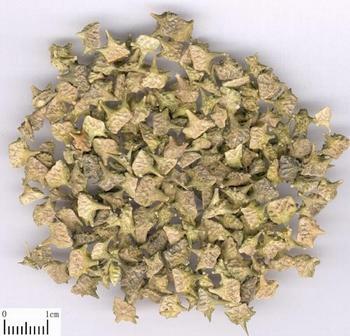 The dry ripe fruit of Tribulus terestris L. of family Zygophyllaceae. Henan, Hebei and Shandong provinces and so on in China. No bad smell, bitter, pungent taste. Even, full, firm and pale. Cut the plant, dry in the sun, take fruit, grind off hard thorns and remove impurities. Stir-bake until it turns yellow or stir-baked with salt water. Bitter, pungent, slightly salty; liver meridian entered. Pacify liver and soothe liver, dispel wind and improve vision. It has actions of pacifying liver for the hyperactivity of liver yang. For dizziness, headache due to liver yang hyperactivity, it is often combined with herbs to pacify liver, such as Gou Teng, Ju Hua and Zhen Zhu Mu and so on. Being pungent, dispersing and with liver meridian entered property, it can soothe liver. For liver qi stagnation, distending pain in chest and hypochondria, it is often combined with herbs to reinforce the actions of soothing liver, regulating qi and alleviating pain, such as Chai Hu, Xiang Fu and Qing Pi and so on. For agalactia, distending pain in breast due to stagnation of liver qi, it is used singly in powder, or combined with meridian-dredging and lactation-promoting herbs, such as Chuan Shan Jia and Wang Bu Liu Xing and so on. For blood-shot eyes with swelling and pain, hyperdacryosis and profuse eye secretion due to wind-heat or nebula and vision-disturbed ophthalmopathy, it is often combined with liver-clearing and vision-improving herbs, such as Ju Hua, Jue Ming Zi and Man Jing Zi and so on. D. Rubella with pruritus Jing Zi and so on. It can dispel wind and relieve itching. For rubella with pruritus, it is often combined with wind-dispelling and itching-relieving herbs, such as Fang Feng, Chan Tui and Ku Shen and so on. For dryness of skin and pruritus due to blood deficiency with generation of wind, it is combined with herbs to nourish blood, moisten dryness, dispel wind and relieve itching, such as He Shou Wu, Dang Gui and Fang Feng and so on.